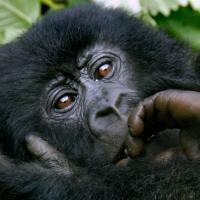 I’m very pleased to announce that my post, “Exploring the Mind of the Mountain Gorilla” was a Finalist for the 2013 Science Seeker Awards in the category of Best Post in Neuroscience & Psychology. There were many extraordinary posts among the 75 nominees in the category and the 350 nominees in all, so I’m honored to be among them. I especially want to I thank the judges, Fraser Cain, Maggie Koerth-Baker, and Maryn McKenna, for the effort that must have gone in to reading and selecting the posts. One reason I am particularly pleased with this award is that “Gorillas” was my favorite post from last year. The news item itself –the fact that gorillas had figured out how to take apart hunters’ snares and then taught younger gorillas to do it— was astonishing in itself. In fact, a lot of people thought so and blogged or reported the story. But when I started to imagine what kind of cognitive ability and foresight it would take to conceive the idea of removing snares and then pass that knowledge along, well that just blew my mind. I knew that was the story to write. The research part of that post was immense. I cited four papers and three books, but am sure I read much more than that. In addition, I really should take a minute to thank the folks at The Dian Fossey Gorilla Fund. Never have I spoken to more passionate and knowledgeable media contacts. Communications Director, Erika Archibald was not only as excited as I was about what the gorillas did, but enthusiastically gave me a wealth of information about the gorillas and the research and community programs taking place in Volcanoes National Park, Rwanda. I think I took 6 pages of notes during our conversation. Getting back to the Science Seeker Awards, below are the the winner and the other finalists of that category. I would like to say, I love Aatish Bhatia’s post on colors. Winning the category is well-deserved. The other posts I hadn’t read before today’s award, but I can tell you now, they are all well-written and eye-opening. Check them out and then hop over to Science Seeker and read the finalists and winners in the other categories. Finally, don’t miss the Science Seeker Blog Post of the Year — Re-Awakenings by Virginia Hughes. It’s an extraordinary story, exquisitely told.